As you learn about dominoes and domino games, you'll likely come across many unfamiliar terms, phrases, and expressions. Like any specialized field of knowledge, dominoes has it's own lingo that has emerged as the game has evolved over time. The derivation of many of these terms may be obscure or unclear, but they are commonly used in discussions of domino rules and strategy. There are also a number of slang terms that are used to refer to specific tiles or situations in particular games. The "back" of a domino is the side opposite the numbers. The back is oten free of any adornment, but may also contain a design, logo, or other pattern. All dominoes must have identical backs, so that players cannot tell what dominoes they are drawing. The "bar" is the line seperating the two ends of a domino. Also called the "center" or "divider". A "blank" is an end of a domino that contains no dots. If both ends are blank, then it's called a "double blank" or a "blank doublet". A blank is also sometimes called a "zero", "white", or "pale". A "block" or "blocked game" is a game in which no player is able to make a move, either to place a domino on the table or to draw a domino from the boneyard. This typically signals the end of a game. Also called a "jam". Domino pieces are sometimes called "bones", because they were originally made of animal bones or ivory. Today they are commonly made of plastic, ceramic, or wood. In addition to bones, dominoes are also sometimes referred to as "stones", "tiles", "men", or simply a "domino". See also: Why Are Dominoes Called Bones?. At the beginning of a game, when all the dominoes have been turned face-down and shuffled, the collection of ramdomized tiles if referred to as the "boneyard". Players draw tiles from the boneyard to form their hands. The remaining tiles are also called the boneyard. Also known as the "reserve". The end of a domino with two dots. A bone or tile used in a game of dominoes is commonly called a "domino". To "domino" also means to play the last tile in your hand, which typically ends a game or hand. 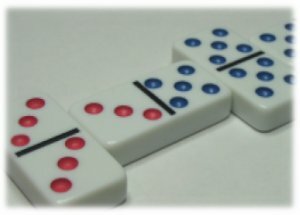 The word "dominoes" can refer to both the game of dominoes, and the domino tiles that are used to play the game. A common misspelling of "dominoes". Each domino contains some number of "dots", usually from 0 to 6, but up to 18 in some sets. A dot is also called a "pip" or a "spot". A domino with both ends having the same value. For example, two sixes is called "doublet six" or "six doublet". Also referred to as a "double". When you transfer a domino from the boneyard into your hand, this is called a "draw". A domino has two ends with a center dividing line. Each end has a number. A domino is referred to by its numbers, so a domino with a 2 on one end and a 5 on the other is called a "2-5" (or a "5-2"). A domino with both ends having the same value is called a "double" or "doublet". A "hand" is the set of dominoes that belong to each player. Contrary to the name, the dominoe are usually not held in the hands, but are placed edge-wise on the table in front of the player, so that the player can see their values, but his opponent(s) cannot. When playing a game that consists of multiple rounds, a "hand" also refers to each individual round in the game. The dominoes that have been played. Also called the "table", "tableau", or "board". An "open end" is an end that is not connected to any other tile. Subsequent dominoes may only be played on an open end. Each domino contains some number of "pips", usually from 0 to 6, but u to 18 in some sets. A pip is also called a "dot" or a "spot". See also: Why Are The Dots on Dominoes Called Pips?. "To set" is to place a tile on the table. It is also used to specifically denote the first tile played. In bidding games, if a player does not make his bid, he has been "set". At the beginning of a game, all the dominoes are turned face-down and "shuffled" in order to randomize the tiles so that no player knows where to find any particular domino. The first double that is played during a game is called the "spinner". In many games, dominoes can be played off all four edges of the spinner - both ends and both sides. Each domino contains some number of "spots", usually from 0 to 6, but u to 18 in some sets. A spot is also called a "dot" or a "pip". The end of a domino with three dots.